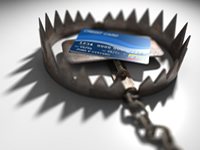 What Is The True Cost of Only Paying The Minimum Payments On Your Credit Cards? AOL’s Finance blog, WalletPop, recently ran an interesting article about how overdraft charges on your bank account can make a cup of coffee cost $38. Don’t believe me? Check out this math! The average cup of fancy coffee with crazy steamed cream or froth at your exquisite coffee shop around the corner costs about $4. But, what if you use your debit card to make the purchase? And, what if it was the close to the end of the month and your checking account was accidentally overdrawn for that expensive coffee? You could get hit with an overdraft charge of up to $34 bringing the total for your daily brew to a whopping $38. That’s crazy! But, it happens all the time. What if you made a lot of those types of little purchases before you got to work and checked your account balance? Your little morning ritual of a few small purchases could turn into hundreds of dollars in overdraft fees. So, that got me thinking about how much things truly cost when we only pay the monthly minimums on our credit card bills. I can remember charging $200 for a brand new car stereo when I was a senior in high school. And, I wasn’t much more responsible with credit cards in college when I charged the cost of my first laptop either. I was a typical first time credit card user. I thought that it was free money, and I was given a $5,000 credit limit for a reason….to use it. In my head and in some weird way, I thought that I had my own little money tree right in my wallet instead of out in the back yard. I never thought twice about carrying a balance on my credit card as a young adult either. I only worried about how much my monthly minimum would be based on my total charging. That was the number I cared about with respect to my monthly budget. That was the only number I was going to pay, only what was required. I always only paid the minimum growing up. It literally took me years to pay off both of those purchases and all the other items I charged. I can’t even remember all the things that I bought with a credit card when I got my first one. All I knew was that I maxed it out and finished with my own tiny mountain of debt. I must have eaten really well at some restaurants or something because there was not much to show for all the fun I had. In fact, that $800 laptop took seven and a half years to finally pay off by paying just the monthly minimum of about $20 a month. It took 91 months to get rid of the debt. And, because of the crazy high 18% annual interest rate, I paid $627.70 in interest over the life of the loan for that computer. That’s almost another laptop. And, do not even get me started about how out of date the computer was by the time I actually owned it all to myself. The details on my $200 car stereo purchase were not much better. If I only paid the minimum payment at an interest rate of 15% annually, I would have only been paying on that bad boy for a little over a year. Instead of racking up debt that will cost you hundreds more than the items you are buying, consider these alternatives listed below. Using a pre-paid credit card like the Vision Prepaid Visa card. Borrowing at a cheaper rate using a peer to peer lending service like Lending Club.